The 813th Strategic Aerospace Division is an inactive United States Air Force organization. Its last assignment was with Fifteenth Air Force at Malmstrom Air Force Base, Montana, where it was inactivated on 2 July 1966. The division was activated in 1954 as the 813th Air Division at Pinecastle Air Force Base, Florida as the headquarters for the base and its two Boeing B-47 Stratojet wings. It was inactivated two years later when the 19th Bombardment Wing moved to Homestead Air Force Base, Florida, leaving only the 321st Bombardment Wing at Pinecastle. 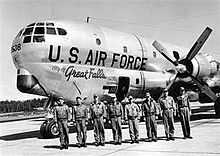 The division was again activated in 1958 at Mountain Home Air Force Base, Idaho as an operational headquarters for Strategic Air Command (SAC) wings at Mountain Home and Malmstrom. It was also responsible for SAC units at forward deployment bases in Canada. The wing moved to Malmstrom in 1964 and was inactivated when its component wings were assigned to other divisions. 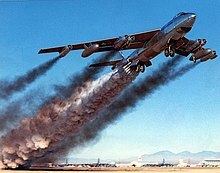 In June 1954, Strategic Air Command (SAC) discontinued its 4240th Flying Training Wing at Pinecastle Air Force Base, Florida and training on the Boeing B-47 Stratojet was concentrated with Air Training Command (ATC)'s 3520th Combat Crew Training Wing at McConnell Air Force Base, Kansas. [note 1] This completed the transition of Pinecastle from ATC to SAC that had begun at the end of 1953 when SAC activated its 321st Bombardment Wing at Pinecastle as a B-47 bombardment wing. On 11 June 1954, SAC organized the Air Division, Provisional, 813th at Pinecastle along with the arrival of the 19th Bombardment Wing, which was transferred from Far East Air Forces to equip with B-47s at Pinecastle. Four days later the 813th Air Division was activated to replace the provisional unit and assume operational command of the two wings. It also assumed base support functions through its 813th Air Base Group, which was manned from the inactivating 321st Air Base Group. Once the division's two wings were combat ready, they periodically deployed to Morocco and the United Kingdom. Although each of the division's wings had air refueling squadrons, flying Boeing KC-97 Stratotankers, attached or assigned, both the 19th and 321st Air Refueling Squadrons were located at other bases. The Air Force reopened Homestead Air Force Base in 1955, and the 4226th Air Base Squadron was organized there and attached to the division. In November the 379th Bombardment Wing was activated at Homestead and replaced the squadron. The 379th spent the next several months becoming organized and manned, but did not receive any tactical aircraft until April 1956. On 1 June 1956 the 19th wing moved to join the 379th at Homestead, and both wings were reassigned to the 823d Air Division there. This left only a single wing at Pinecastle, so there was no longer a need for a division level organization there. The 813th was inactivated and the 321st wing was reassigned directly to Second Air Force, while the personnel and equipment of the 813th Air Base Group were transferred to the wing's 321st Air Base Group. The division was reactivated at Mountain Home Air Force Base, Idaho in 1959 as an operational headquarters for the B-47 bomber wing at Mountain Home and the 4061st Air Refueling Wing, which flew KC-97s from Malmstrom Air Force Base, Montana. The division also assumed responsibility for SAC base units located at bases in Canada where tankers were forward deployed. 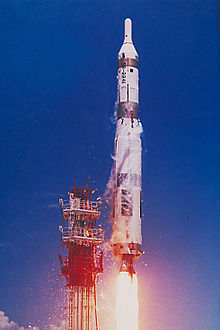 In June 1961, the division's 9th Bombardment Wing added an HGM-25A Titan I squadron, and the division maintained the capability to conduct long range bombardment operations and strategic missile warfare. The following month, the 4061st wing was discontinued and its 97th Air Refueling Squadron reassigned to the 9th wing, while remaining at Malmstrom. In the spring of 1962 SAC units with responsibility for both bomber and missile forces were redesignated to include the term aerospace in their designations. The 813th became the 813th Strategic Aerospace Division, while its 9th wing became the 9th Strategic Aerospace Wing. In July 1962, the 4364th Support Squadron was activated at Mountain Home and assigned to the division, but attached to the 9th wing. The squadron was one of four EB-47 airborne radio relay squadrons activated by SAC to provide communications with SAC elements during a strike against the United States as an airborne counterpart to its underground command posts. The 4364th was inactivated a little less than three years later in March 1965, when the Post-Attack Command and Control System was transferred to air refueling units flying Boeing EC-135Cs and located at bases with the command posts. ^ The 3520th Flying Training Wing was redesignated as a Combat Crew Training Wing in September 1954. ^ Colonel McCoy was killed in the crash of a B-47 while commanding the 321st Bombardment Wing in 1957. Pinecastle was renamed McCoy Air Force Base in his honor. "Behind the Legend of Col Mike McCoy". Orlando Sentinel. 7 October 2007. Archived from the original on 23 May 2011. Retrieved 10 May 2014. ^ a b c d e f g h "Factsheet 813 Strategic Aerospace Division". Air Force Historical Research Agency. 11 October 2007. Archived from the original on 30 October 2012. Retrieved 22 March 2014. ^ "Abstract, History 4240 Flying Training Wing Jan-May 1954". Air Force History Index. Retrieved 10 May 2014. ^ See "Abstract, History 3520 Combat Crew Training Wing Jul-Dec 1954". Air Force History Index. Retrieved 10 May 2014. ^ a b c d e Ravenstein, Charles A. (1984). Air Force Combat Wings, Lineage & Honors Histories 1947-1977 (PDF). Washington, DC: Office of Air Force History. pp. 172–173. ISBN 0-912799-12-9. ^ a b "Abstract, Initial History 813 Air Division". Air Force History Index. Retrieved 10 May 2014. ^ a b "Abstract, History 813 Air Division". Air Force History Index. 1 July 1955. Retrieved 10 May 2014. ^ "Abstract, History 321 Bombardment Wing June 1956". Air Force History Index. Retrieved 10 May 2014. ^ a b "Abstract, History 813 Strategic Aerospace Division". Air Force History Index. 1 January 1963. Retrieved 13 May 2014. ^ "Factsheet 97 Air Refueling Squadron". Air Force Historical Research Agency. 1 April 2008. Retrieved 13 May 2014. ^ a b Ogletree, Greg (n.d.). "A History of the Post Attack Command and Control System (PACCS)". Archived from the original on 10 September 2012. Retrieved 14 May 2014. ^ "Abstract (Unclassified), History 9 Strategic Aerospace Wing (Secret) Jan-Mar 1965". Air Force History Index. Retrieved 14 May 2014. ^ Mueller, Robert (1989). Air Force Bases, Vol. I, Active Air Force Bases Within the United States of America on 17 September 1982 (PDF). Washington, DC: Office of Air Force History. p. 256. ISBN 0-912799-53-6. ^ See "Abstract, History 4240 Dispensary Pinecastle Air Force Base FL Jan-Jun 1956". Air Force History Index. Retrieved 10 May 2014. This page was last edited on 10 November 2018, at 04:33 (UTC).